Our FAQ section can guide you through some questions that you may have. I just scheduled a shoot. Now what? Once you schedule a shoot, you will get an email confirming your schedule. You will also receive an email 12 hours before your scheduled shoot. Please make sure the property is ready for the shoot. Follow the guidelines here “How do I prepare a property listing for a video or photography shoot.” Once we are finished shooting the property, we will contact you via email. If you ordered a video walkthrough, your video will be available within 3 business days and you will receive an email containing all the links for you to use your new video walkthrough. If you ordered photography, you will receive an email within 24 hours with links to download your photos. Once your videos or photos have been completed and emailed, you will receive an invoice that is due immediately and can be paid online. We service most of Wake and Johnston county. These are the cities we service: Angier, Apex, Archer Lodge, Benson, Cary, Clayton, Forestville, Four Oaks, Fuquay Varina, Garner, Holly Springs, Knightdale, Pine Level, Raleigh, Rolesville, Selma, Smithfield, Wake Forest, Wendell, Willow Springs, Wilson, Wilsons Mill, and Zebulon. If you don’t see your city listed, we probably do not service that area. You can contact us here to see if we can service a city or area outside of Wake or Johnston counties. How do I prepare a property listing for a video or photography shoot? In preparation for video walkthroughs and/or photography we recommend that you stage your listing as you would for an open house or showing. We ask that your property is tidy, clean, clutter free, pets and any pet paraphernalia put away, and personal photos put away. Please be aware that our videographers and photographers are not permitted to clean, dust, move furniture or stage the property. We also ask that no other tradespeople such as painter, plumber, handymen, or other people present during the shoot. Hide small appliances such as toasters, coffee makers, etc. Use the commonsense approach when preparing your property for a shoot. Remember, proper preparation of your property will ensure the best results and will help sell your property faster. Does the realtor or owner need to be there during the shoot? No. When you schedule a shoot you will be asked to provide access to the property. For video walkthroughs and drone videos, we ask that the property be unoccupied. It’s best that only the video ans/or photo crew is present during the shoot so that we can ensure a smooth and convenient shoot. We make every effort to turnaround photos within 24 hours, except on weekends. Video walkthroughs are 3 business days from date of shoot. See chart below for turnaround time on real estate photography. Drones - How long do drone photos/videos take? Drone photography and/or videos take anywhere from 1-2 hours depending on the size and scale of the property and project. Realtors or owners do not have to be present. However, the owner of the property will have to sign and submit our Property Owner Consent Form prior to the drone photo shoot. This form just is legally required for any commercial drone operation and gives us the permission from the property owner to launch and land a drone on their property. Drones - Are you FAA compliant? Yes! We have taken extra measures to ensure we fly safe and stay complaint with the FAA when flying our drones commercially. Our pilots are trained and have passed the Part 107 rule by the FAA for flying sUAS (Small Unmanned Aircraft Systems). Drones - Are you permitted by North Carolina? Yes! We have obtained our NC Commercial UAS Operator Permit and abide by all applicable federal, state and local laws, regulations and ordinances. Our valid Permit Number is C0001056. What are Real Estate Video Walkthroughs? Real Estate Video Walkthroughs are a new way to showcase your property listings with high quality, “Hollywood” style, stable gliding effect video which produces stunning cinematic views for potential buyers to “walk through” your homes and see the layout and highlights – anywhere, anytime, on any device! How do I download the photos from DropBox? When your photos are completed, you will receive a link to download your photos from our DropBox. You can download the whole set of photos as a ZIP file. To do this, click on the link that you were provided, once you see your list of photos you will notice in the top right-hand side a drop-down button labeled “Download” that you will click. 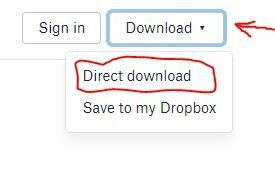 Once clicked, you will see an option for “Direct Download”. This option will download all your photos into a ZIP file to your computer. Be patient, as this can take a few minutes depending on your internet connection. How do I share my videos on MLS, website, and social media? Once your video walkthrough and/or photos are ready, you will receive an email from us with links to your video (branded and unbranded) and/or photos to post on MLS, your website, and your social media sites. Once your video is ready, we will provide you with a link to download your video. Once you download your video, you can upload it to your youtube account. We make every effort to ensure that your videos will work on a variety of devices and browsers. However, some older devices and browsers are not compatible with current methods for playing Internet video. Please see below for a list of compatible and non-compatible browsers and operating systems. If you are using a non-compatible browser or operating system, switching to a compatible one should take care of the problem.